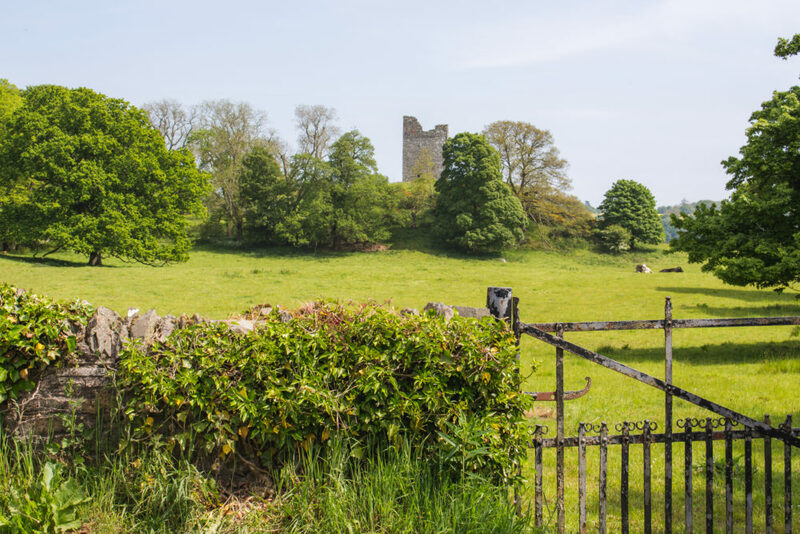 There is no dening Northern Ireland has so much to offer. The cliffs, the magnificent hills, the beaches? There is a lot to do for sure! 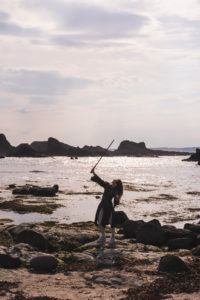 The most popular activities are undoubtedly fishing, cycling and driving along the famous coastline. 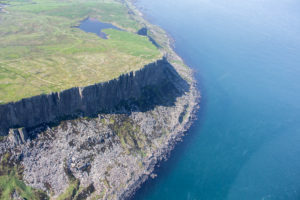 The roads in Northern Ireland are considered some of the most beautiful in the world and the views of the Atlantic and the cliffs are priceless. No wonder the country was chosen as the shooting location for the popular TV series Game of Thrones. The sights of Northern Ireland make a perfect background for the fantasy show! HBO’s series is one of the biggest and most exciting things to happen to Northern Ireland for sure! This global phenomenon is providing Northern Ireland with once in a lifetime tourism opportunity. 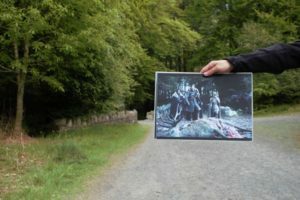 While Season 8 is still in production, Tourism Board Ireland invited me and 4 other bloggers and journalists for the one-of-a-kind Game of Thrones Tour experience. We were hosted by Adrian who is also one of the extras in the show – his knowledge was irreplaceable! 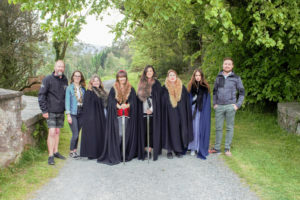 We had a pleasure to see the majority of 26 shooting locations as well as to taste some ‘GOT’ specialities including Winterfell lunch at The Cuan and Game of Thrones afternoon tea at Ballygally Castle. You can book yourself a tour all year round, but May-October are said to be the best month of visiting the country. The weather might be nicer (you know how it is in the North, winter is coming). 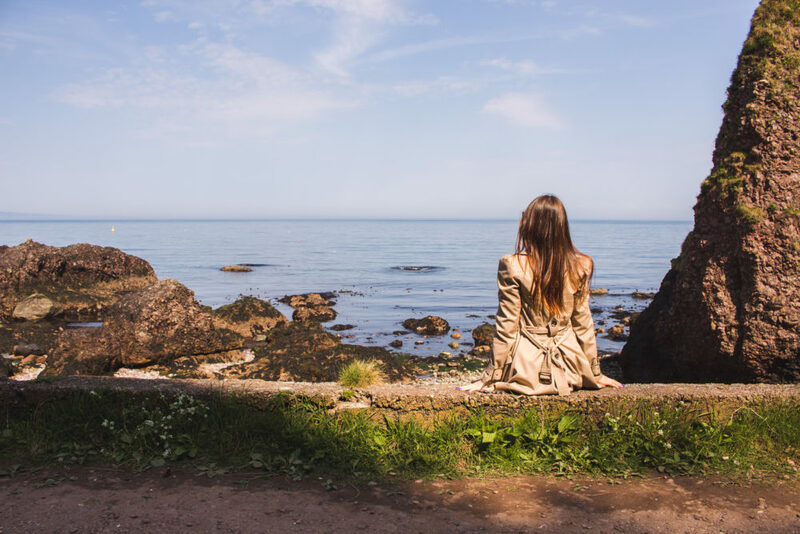 There are 4 departure options – you can start in Dublin, Derry, Tollymore or Belfast. 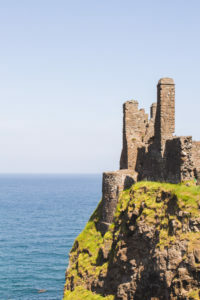 You could either book ‘The Ultimate North Coast Experience‘ featuring Carnlough and Dunluce Castle (see some of my photos below) or ‘The Real Locations of House Stark‘. Both trips take around 9-10 hours. The cost is £50 for adult and £45 students. Quite a breath-taking Irish view! The plateau is located above a Bronze Age fort. It is the area where Ned Stark sentenced the Will of the Night’s Watch to death in the Season 1 Episode 1. 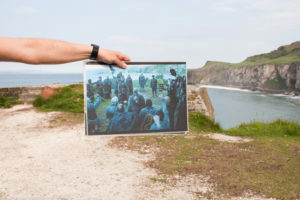 The same location was also featured in Season 5 as a place where Littlefinger convinced Sansa to marry Bolton. 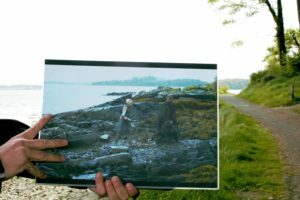 What I really found useful is the handset of screens that HBO provided in order for people to know about the filming locations. There is a lovely Hotel called Ballygally Castle, not too far away from Carincastle (15 minutes driving). 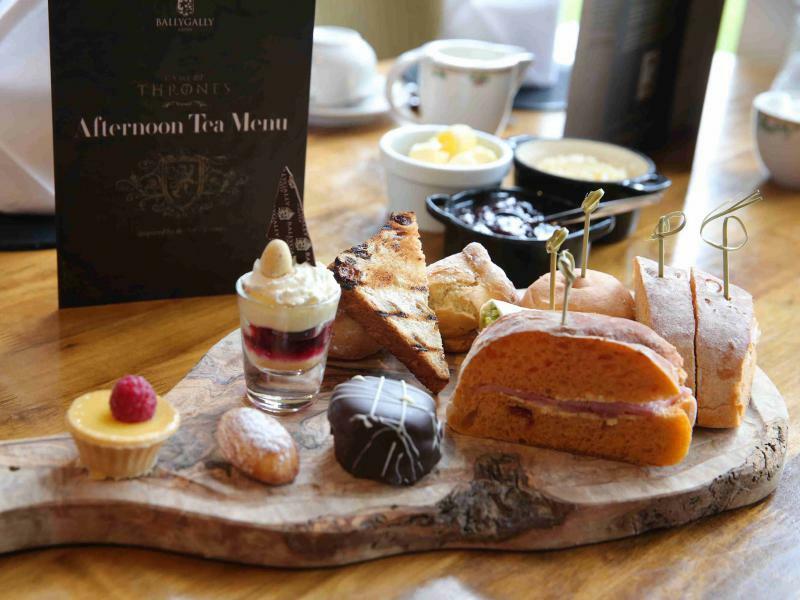 I would really recommend stopping by for their iconic ‘Game of Thrones’ Afternoon Tea. 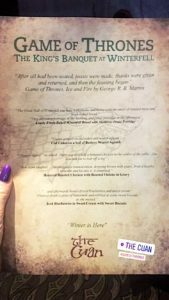 You will be able to taste Jon Snow Cakes (freshly baked scones), Baratheon Bread (toasted fruit loaf), Ham&Targaryen Mayonnaise on Batch Bread, Sansa Stark’s Lemon Cakes or Dothraki Trifle with Mini Dragon’s Eggs. The price is £24 per person. Some of the sights are so magnificent and photogenic that they are used more than once – Murlough Bay was one of them. It is placed among Europe’s most beautiful driving roads – the wild windswept cliffs! 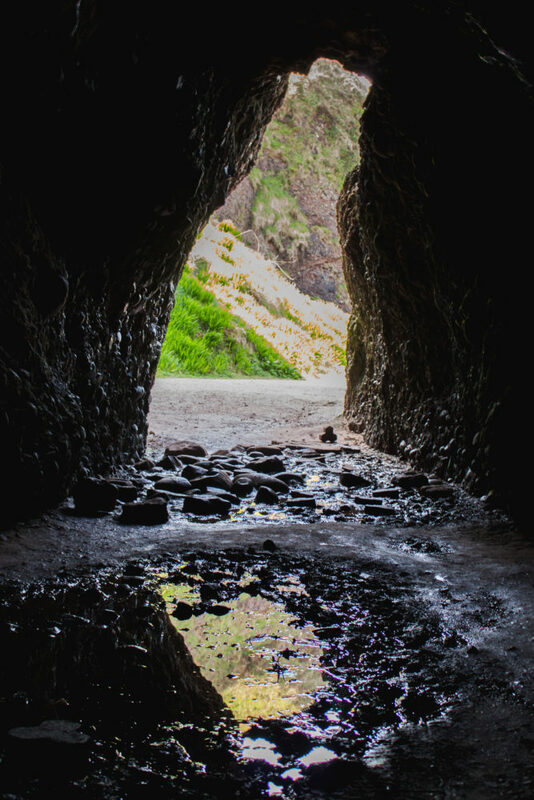 It is where two Baratheon brothers Stannis and Renly confronted in Season 2 Episode 4 and where Tyrion and Jorah were captured by the slavers in Season 5 Episode 6. The area and the views will definitely leave you speechless. This dramatic headland was used in Season 2 Episode 3 as Renly’s camp. In Season 6 Episode 5 it was the setting for the Kingsmoot, where Euron Greyjoy was chosen as ‘ the King of the Iron Islands’. 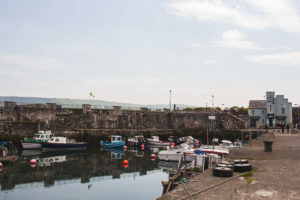 Carnlough is a small harbour situated in the small coastal village. 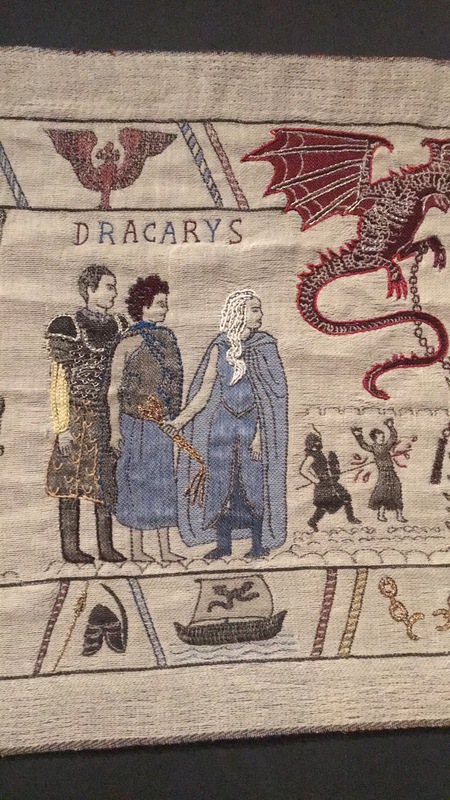 The place was used in Season 6 Episode 7 for…. around 20 seconds! It was when Arya ’emerged’ from the water after being stabbed by the Waif, and crawled up the harbour steps onto the streets of Braavos. As a matter of fact – Braavos was shot in Girona, Spain. 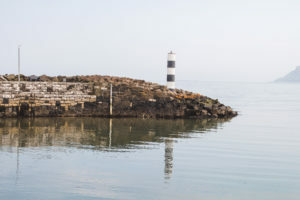 The crew headed to Carnlough in order to shoot this particular scene. The whole village looks like it was taken from a fairytale, with all the colours and the sea. 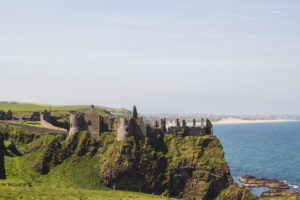 Dunluce is a 16th-century castle, perched on the cliff edge and partly fallen into the sea. 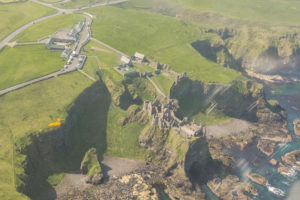 Dunluce castle was used for the establishing shot of Harrenhal castle when Robb Stark and Roose Bolton arrive to witness scenes of devastation. It is also home of Greyjoys in the Season 5/6. 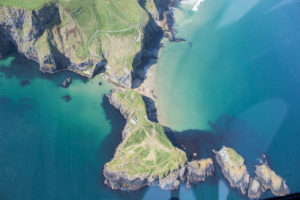 We departed Bushmills Inn for this amazing tour – we flew over the edge of Ireland. 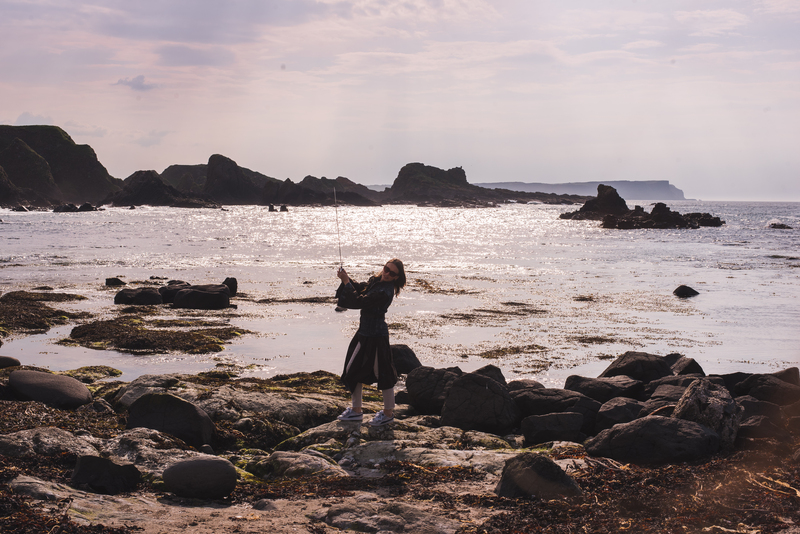 We saw ‘the Dragonstone’ and Dunluce Castle, the shores, the beaches and the beauty of nature. See it for yourself! You could book this trip under this link. It is not included in the standard Game of Thrones Tour, but it is something I would definitely recommend doing. 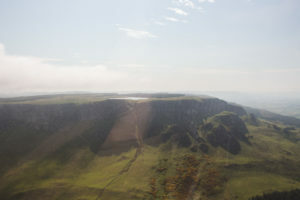 The helicopter tour takes 60 minutes and costs £225 ( 3 seats available). 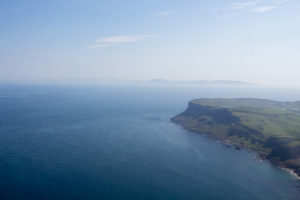 Fair Head rises 600ft above the sea level and is definitely… quite hard to oversee in this part of Ireland. It was used as Dragonstone in Season 7. It is a charming area with gardens and woodland, where many scenes were shot in Season 1. The way from Belfast to ‘Winterfell’ is also fun, as you will get a ferry across ‘the Narrows’. The afternoon trek at Castle Ward Estate takes around 1 hour 30 minutes (3km). The locations include Winterfell, ‘The Twins’ and Robb’s camp locations. 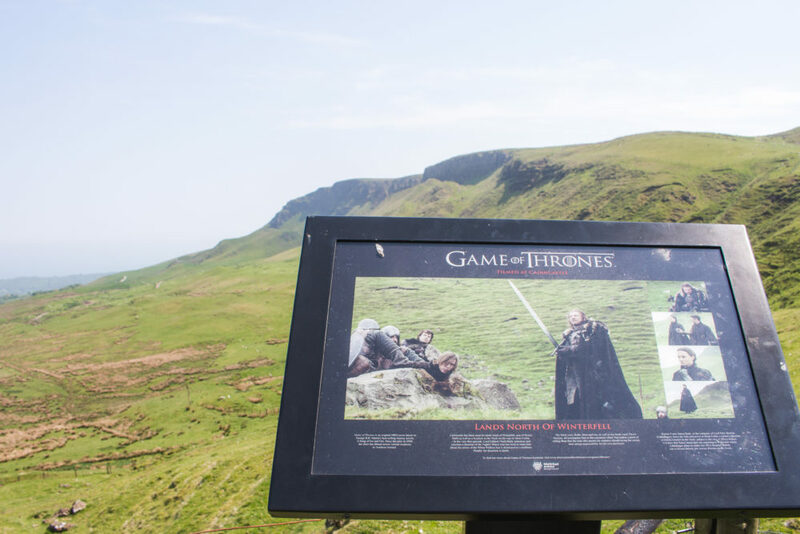 There is nine Game of Thrones® film locations on site, all close together. 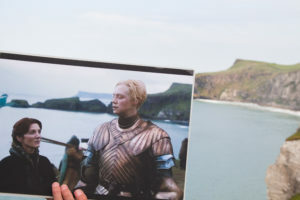 Other classic scenes filmed nearby include the spot where Brienne of Tarth dispatched three Stark bannermen and the Battlefield of Baelor, where she dragged Jamie Lannister back to Kings landing as well as where Robb Stark and Tallisa discussed him marrying one of Walder Frey’s daughters. You could also see your favourite scenes from the series on a cycle tour! What are the favourite sweets of Sansa Stark? 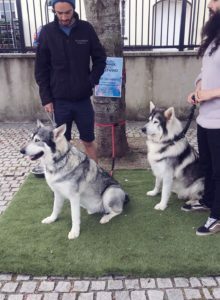 On your way back, you could also be lucky enough to meet the Direwolves <3 They are Odin and Thor who played Summer and Greywind in Season 1. We met them just outside The Cuan. 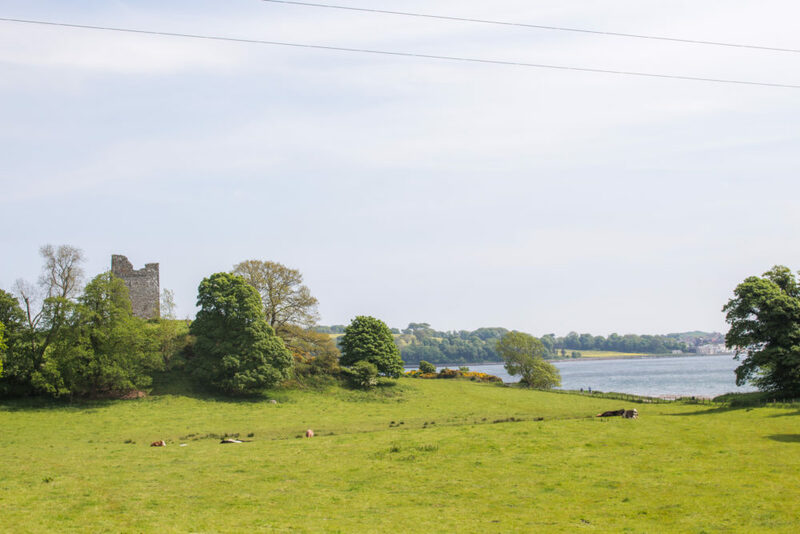 Situated in the Castle Ward estate, Audley’s castle overlooks the waters of Strangford Lough. It is, the way I see it, quite an idyllic view – especially during this time of the year. You can actually feel like you were in the Game of Thrones! The tower was used as Walder Frey’s twins in the series. 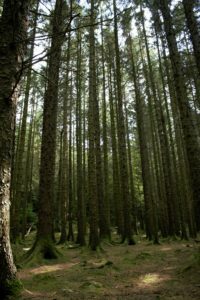 Tollymore was used more than twice in the first Season. It was where Ned Stark and his sons found the dead direwolf and the pups in the pilot Episode. It was also where the Nights Watch were ‘attacked’ by the white walkers, also the pilot Episode. Finally, it was where Tyrion and Jon Snow stopped on their way to the wall. Tollymore Trek takes 1 hour 45 mins and requires a good fitness 🙂 Some inclines are uneven surfaces. 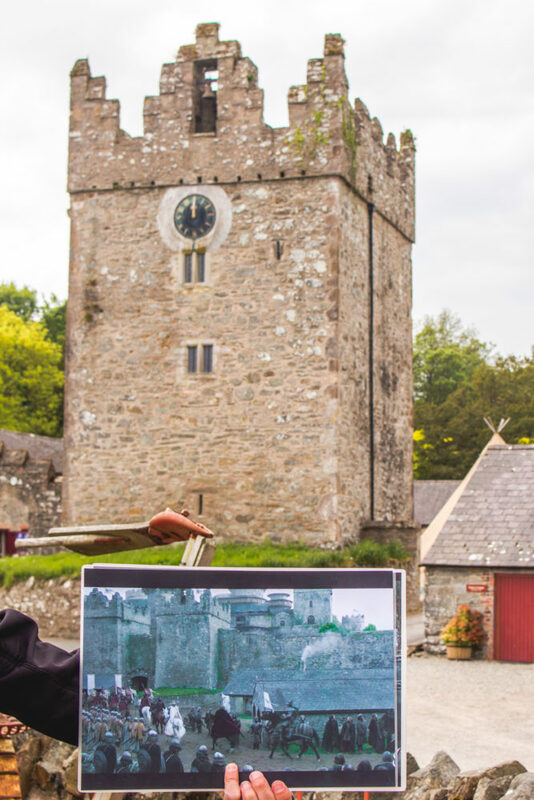 Game of Thrones tours provides ‘the Stark cloaks’ for some really cool photos. 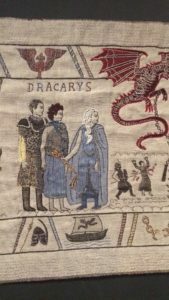 Game of Thrones tapestry. 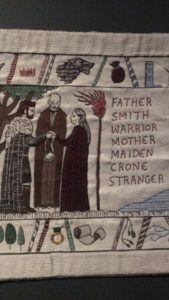 An incredible 77-meter long medieval-style wall-hanging made from Irish linen (only) in on display at Ulster Museum and has attracted over 100k visitor since its opening. 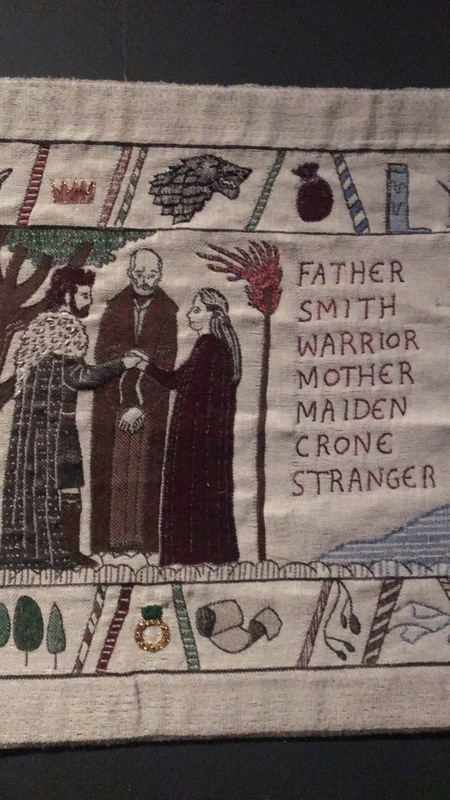 Tourism Ireland created the tapestry for their social media campaign in 2017. It appeared to be a great success – aired over a period of 8 weeks, it generated 33 million views! 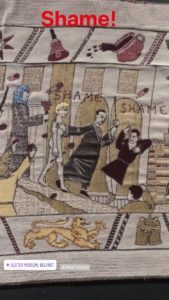 The tapestry was created by 30 embroiderers from Northern Ireland and they spent over…1000 hours hand stitching every detail! Once again, I would like to say THANK YOU for Tourism Ireland for taking me on this trip. It was a great experience, I have seen a lot in such a short time! Looking forward to my next visit and spreading the word about how beautiful Northern Ireland is! 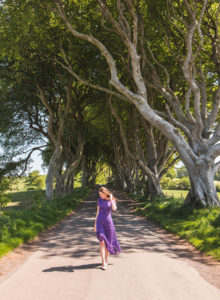 I think that I might be the only person to have not watched Game of Thrones but these look pretty amazing places to see full stop! you are not the only one Love :* I really recommend to watch it tho! I love, love, love this. I really like that you have examples from the movie to show exactly the scene that was filmed there. Such unique and cool experience, right? 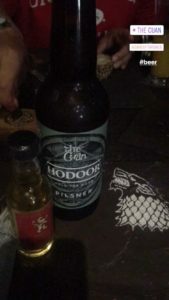 We are GOT fans and we can’t wait for the new series. Your post made us even more excited. Thank you for sharing. Can you believe I haven’t seen Game of Thrones yet? After seeing these photos and reading the many references, I really feel like I’m missing out. Maybe I should do it the other way around: first take this trip and then watch the series as a way to relive it. 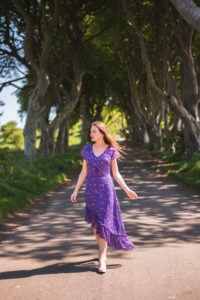 The Dark Hedges and Dunluce Castle certainly look magical (and the afternoon tea oh so tempting)! AHHH I have to cuddle a Direwolf!! 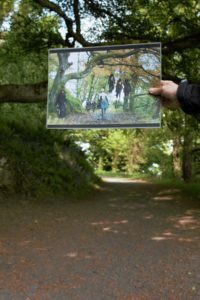 This is really awesome to read about – a friend of mine did the tour a while ago and he loved it, so this has really given me the inspiration to get over to NI and do the same! Thanks for sharing! I got to admit, I am probably the last person on the planet who hasn’t watched the Game of Thrones lol but the setting looks incredible! The Dark Hedges especially is so beautiful. I love being inspired to travel by TVs and movies! I have to watch this show! As a passionate lover of GOT, I must admit that you’ve done a perfect job discovering and exploring all these places, Claudia! 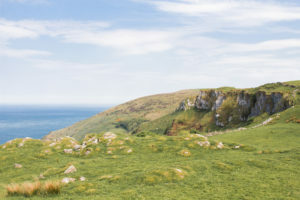 Northern Ireland is always a great idea, I am even more inspired to explore it now after reading your post. 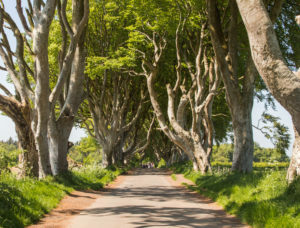 The Dark Hedges made my mouth drop! I am in shock! I love it I hope one day I get to go there is such an amazing serie. I watched it at least 4 times this year! amazing pictures you have!